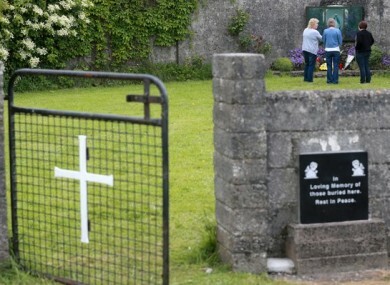 THE BODIES OF a “significant” number of babies and children were discovered in sewage chambers on the grounds of a mother and baby home in Tuam, it was confirmed today. The findings vindicated the work of researcher Catherine Corless, whose discoveries about a mass grave at the site of the home, run by the Bons Secours Sisters, were made public in 2014. She uncovered the death records for 796 children – ranging from infants to children up to the age of nine – from the home. But what she couldn’t find were records of their burial in any graveyards. Corless’s research, coupled with stories of local boys finding bones in a septic tank on the site, led her to believe the bodies were all buried in that one area. The death rate of babies at the home was significantly higher than that at other homes around the country – double the rate, in fact. Figures from the National Archives showed that 31.6% of babies under the age of one at Tuam died over the course of one year. Now that the presence of human remains on the site has been confirmed, what happens next? That all hinges on two things: What the coroner determines, and what the Mother and Baby Homes Commission of Investigation decides to do next (which will in large part be determined by what the coroner says). A test excavation was undertaken by the Commission of Investigation on the Tuam site in 2015. Further excavations took place at the end of 2016 and January/February 2017. These discovered two large structures, one of which appears to be a large sewage containment system or septic tank filled with rubble and debris, and the other a long structure divided into 20 chambers. Again, this is thought to be related to sewage containment. “Significant quantities” of human remains were found in these chambers. The results of remains that were tested showed they belonged to children aged 2-3 years and of approximately 35 foetal weeks. The Commission of Investigation said that it is “shocked” by the discovery. Coroners – who are either qualified doctors or lawyers – look into the circumstances of a sudden, unexplained, violent or unnatural death. Their investigation helps determine if the death was through natural or unnatural causes. The coroner will also determine whether an inquest is due into any of the deaths at the Tuam mother and baby home. If a death may be due to unnatural causes, than an inquest must be held by law. The gardaí liaise with the coroner in the case of an inquest being called. If an inquest into any of the deaths in the mother and baby home takes place, it will be held in public. they do not decide whose fault it was or whether there was a criminal offence. At today’s press conference, Minister Katherine Zappone said that the coroner’s results would determine the direction of the investigation into the remains. She said that the commission will determine if other sites need to be excavated, including another part of the Tuam site. There will be an information line for factual information, and a service for those who feel personally affected by the news. When contacted, the Commission of Investigation said it would not be adding anything more to Minister Zappone’s statement today. In 2014, the Minister for Justice ordered a report from An Garda Siochána to establish how much information it holds about the revelations. Fitzgerald said at the time that decisions about any criminal investigation will be up to the gardaí. TheJournal.ie has contacted the Justice Department to see when, or if, that report was furnished to the department. Email “Tuam babies: Next steps in finding the truth behind their deaths”. Feedback on “Tuam babies: Next steps in finding the truth behind their deaths”.